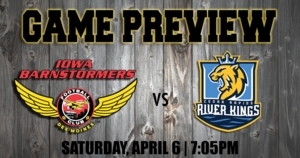 Des Moines – The undefeated Iowa Barnstormers (4-0) return home for the second game of a doubleheader against the Cedar Rapids River Kings (1-4) this Saturday, April 6. Kickoff is set for 7:05 p.m. CST at Wells Fargo Arena. Last week, the two teams collided at the U.S. Cellular Center in Cedar Rapids for the first game of a two-week series. The Barnstormers came away victorious, winning 41-20. Iowa quarterback Daquan Neal led the offense on the ground this week, scoring three rushing touchdowns. He also threw one to his favorite target, receiver Ryan Balentine. Defensively, the Barnstormers did a solid job against a River Kings offense led by quarterback Kurt Palandech. Palandech went 13 for 23 for 105 yards, an interception and a touchdown. The interception came when defensive lineman B.J. Butler tipped Palandech’s pass in the air and fellow defensive lineman Desmond Raiford caught it. The turnover led to a score on offense for the Barnstormers, which extended their lead. After a tough first game, the River Kings will try to even the season series up this weekend. The Iowa Barnstormers will be hosting their Annual 90's Night this Saturday, April 6. Grab your fanny pack and get ready to jam out to your favorite 90's tunes all night. Tickets are available at the Iowa Barnstormers official website or fans can call 515-633-2255 to speak with a ticket representative. Season Tickets remain on sale for the Iowa Barnstormers 2019 season! Lock in the same great seat at every remaining home game and enjoy exclusive Season Ticket Holder perks. Don't miss a minute of the action! For more information, call the Barnstormers at (515) 633-2255.